After getting the machine-learning fun started with the wildly amusing how-old.net, Microsoft's tackling the world of ambitious facial hair. Microsoft Garage wants you to pit your Movember ‘stache against the rest of the world at MyMoustache.net. 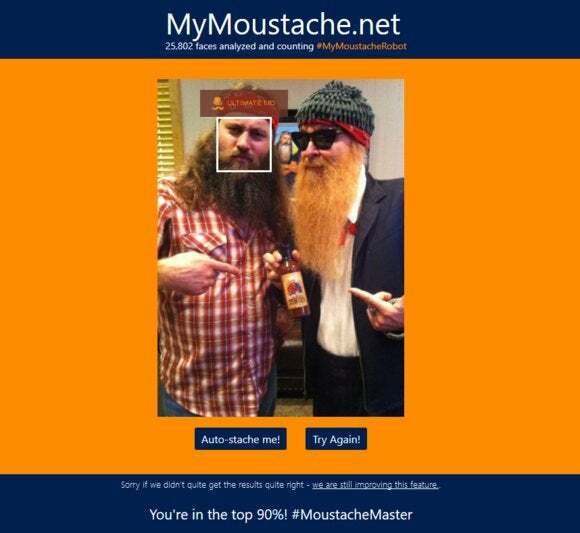 All you have to do is upload a selfie to the site and Microsoft’s server farms will rank your facial hair against all comers. Microsoft’s site can also “auto-stache” you with a fancy 19th century handlebar mustache or something a little more modern. If my tests are any indication, the current crop of Mustache competitors are mostly bare-faced gentleman like myself. 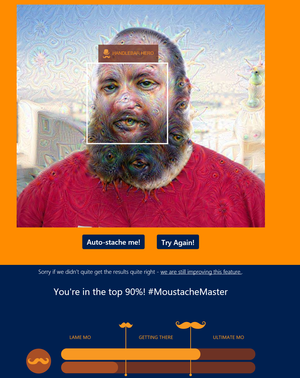 Either that or Microsoft’s machine learning is still having a tough time with facial hair. Just a little bit of 24-hour stubble was enough to beat out 64 percent of the field and get well within the “getting there” rank. The story behind the story: While for most folks November is about getting ready to eat copious amounts of turkey and kick-off the holiday shopping season. The Movember movement encourages men across the country and around the world to grow out their facial hair to raise awareness about male health issues such as prostate and testicular cancer. Movember participants often collect charitable donations as part of the month long grow-a-thon, and Microsoft’s MyMustache.net project is no exception. You can find the site’s donation page on the Movember site. PCWorld senior editor and handlebar hero Brad Chacos has an ultimate mo' that even a trippy Dreamscope filter can't hide. If you’ve got a ‘stache that enters a room a few seconds before you do MyMoustache.net has no trouble pushing you past the “ultimate mo” minimum benchmark. MyMustache.net also wasn’t foiled by the attempt to obfuscate the ultimate stachiness with a little Dreamscope magic, as seen at right. The base, unaltered headshot received the same moustache master rating. When you use a photo on MyMoustache.net Microsoft says it creates “data points” about the image and also records your general location. The company says it does not collect personally identifiable information.